Saxon homeschool math curriculum is a popular program. I used the materials in the 1990’s. It uses a spiral approach. This method teaches several topics in small increments. The topics advance in difficulty each time it is taught. The addition, subtraction, multiplication, and division facts are learned in the first through third grades. It is expected that your child will know his facts and will be able to do more complex problems by fourth grade. 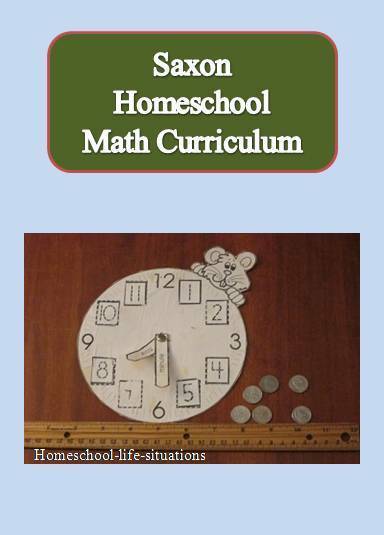 Besides learning math facts your child will learn about time, money, and graphing. Grades first through third come with a teacher’s manual, meeting book, a workbook, and flash cards.The kindergarten book comes with a teacher’s manual and student book.The lessons in the teacher’s manual are scripted. You will need to buy a manipulative kit. It is vital for teaching the math concepts. The kindergarten curriculum teaches counting, number recognition, shapes and other beginning math concepts. The first through third grade programs continue to teach math concepts. At the end of third grade your child should know his math facts, telling time, place value, the value of the different United States coins. I have used the first through third grade Saxon homeschool math program. My children thought that the math was fun and understandable. I found it easy to teach. I did not have to teach about calendars, the weather, and graphing as a separate subject. The program is complete. Saxon has textbooks for upper elementary grades, middle school, and high school. Starting in the fourth grade there is no longer a teacher’s manual. The lessons are not scripted. The lessons no longer use a manipulative. There are explanations on how to do problems in the textbook. There is also a solution manual that you can buy so you will have the answers to the questions. My children had a lot of difficulty using math 5/4 because of the changes. I stopped using Saxon homeschool math after the fourth grade. I think that Saxon homeschool math could have used the fourth grade as a transition time. Maybe there should be a supplemental teacher’s manual for struggling students. If your family likes Saxon you can find textbooks in algebra, geometry, calculus, and physics. The physics class is not an introduction. It is an engineering physics course. The upper grade textbooks would be good for children who are independent learners and good with math concepts. If your child struggles with math there are now math helps to go along with the curriculum. There are several companies that now provide help for teaching math. Here are several companies that I have read about. Saxon Teacher CD-ROM is the official supplement for the math program. It provides step by step solution to the problems in the lessons and questions on the tests. There is a package for each of the different textbooks starting with Math 5/4. The CD’s are not inexpensive and you will still need to buy the textbook. Mastering Algebra John Saxon’s Way is a set of DVDs produced by Art Reed. The problems that he uses on the DVDs are not the problems in the textbook but are similar. You can buy Mastering Algebra for 7/6, 8/7, Algebra 1/2, Algebra 1, Algebra 2, and some of the advanced math subjects. DIVE (Digital Interactive Video Education) is another CD ROM help. Your child can watch video clips of problems being solved while following along in his text. There are DIVE CDs for math 5/4 through high school. There is also a physics lab CD. Even though my family did not use the Saxon homeschool math program after the fourth grade, my families like the program and are successful.